hello again with Hubert dining at same table. showing me his cute grand daughter on his phone. 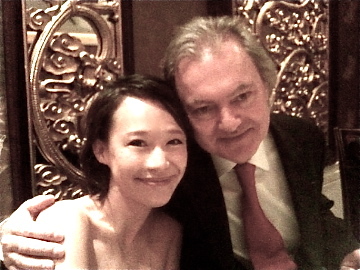 Arrived at Summer Palace, Island Shangri la, Hk “fashionably late” in this not very much of a fashion event. I was in fact not too cool (as you won’t worry of being fashionably late when you were right?) kept worrying if I’d already missed some real good wine. 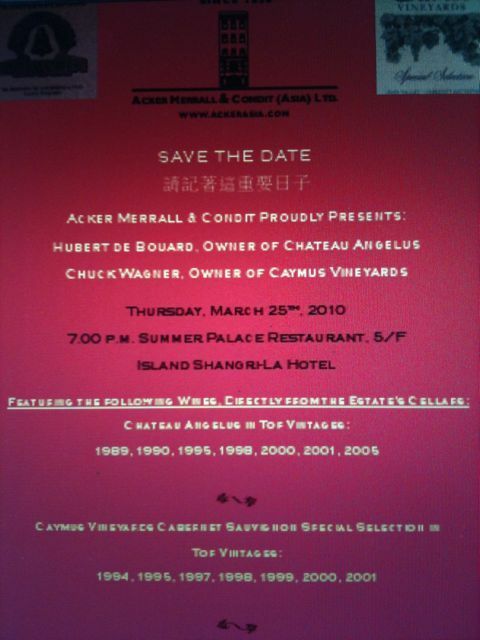 It’s the 2nd night of pre-auction dinner featuring my very favorite Chateau Angelus and Nappa Valley’s Caymus. 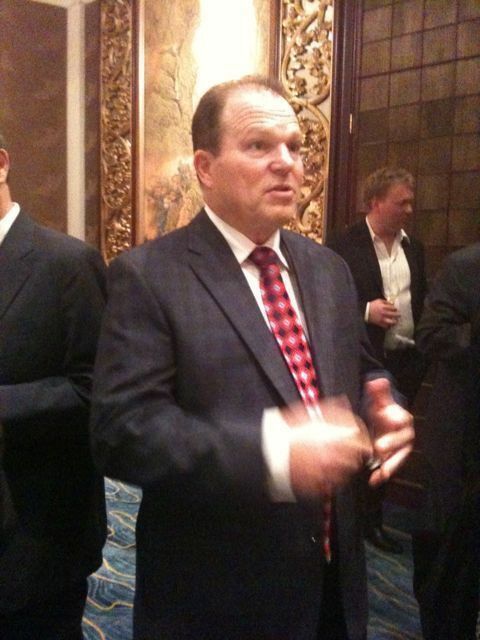 Got introduced to Caymus owner Chuck Wagner and there! I saw Hubert around the corner. “oui, bien sur! How can I forget such a beautiful lady! Cava?”, Hubert greeted me frenchly on my cheeks. “C’est très français! Telling ladies they are beautiful no matter if that’s the truth. It’s nice greeting hey!” I thought. Hubert de Boüard de Laforest is the owner of Chateau Angelus whom I met last summer at his Chateau and his home with his family including his beautiful daughter Stephanie and son in law Marc. I was especially impressed and befriended with his funny and energetic wife, Corinne. She is beautiful, charming and darring at tables showing me all her jewelery and introduce me to her cats and dogs (one call Petrus!). While to me, Hubert is an extremely wise and charming monsieur. 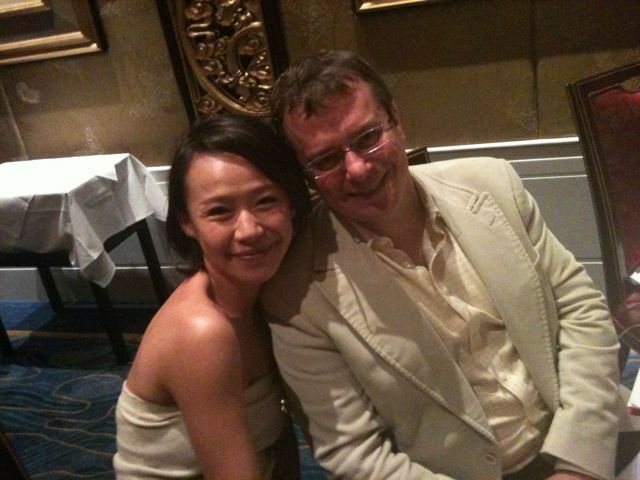 He is warm, intelligent, gentlemanly and fatherly. His energy not only brought elevation of Angelus from Grand Cru Classé to Premier Grand Cru Classé B status in 1996, but also became 007’s favorite in the Bond film, Casino Royale, an arrangement which seems to have come about as a result of Hubert’s friendship with Daniel Craig. my table incredible- where to place our food hey? plus, I got confused! you? The pairing of food doesn’t feel exactly enlightening during the night. Peking duck, prawns (I hate piling off prawn’s skin!) , and beef cheek to my records. However after that beef cheek, my head didn’t record any of the food I had, but Angelus. 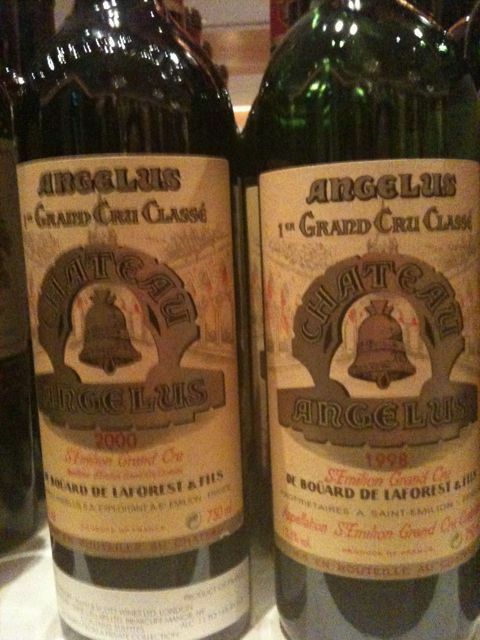 Caymus and Angelus were both being served side by side. Everyone were discussing which wine they like better. To me however, is probably a question of if you are a Nappa fan or a Bordeaux lover. I am definitely a French maniac! Plus, I love Angelus. Not sure if it’s the bell on the label, or the very warm welcoming at their house last summer or purely the inky wine. I just love it. 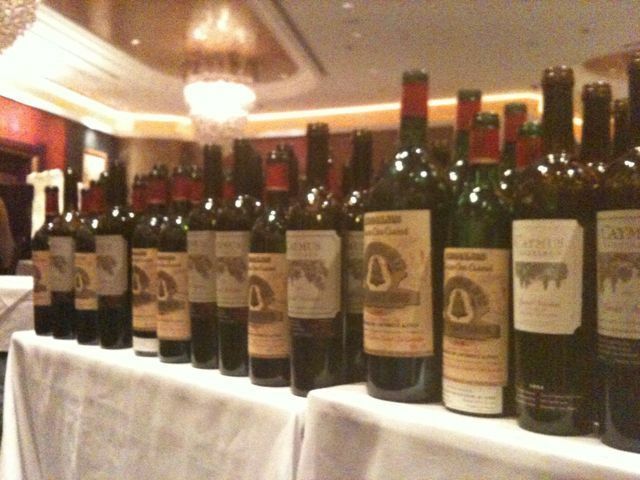 I really love the big, beefy, super-rich 89 and 90 vintages, will that be the history of Angelus being reclassified on 1996, subconsciously? Nose is not the clean yet complex cherry nose which I recently fancy (like the recently drank Chambertin Rousseau, mmm… I love the nose there) but it’s another style of smoky vanilla oak, jammy cassis. The juice itself is super crammed with fruit. 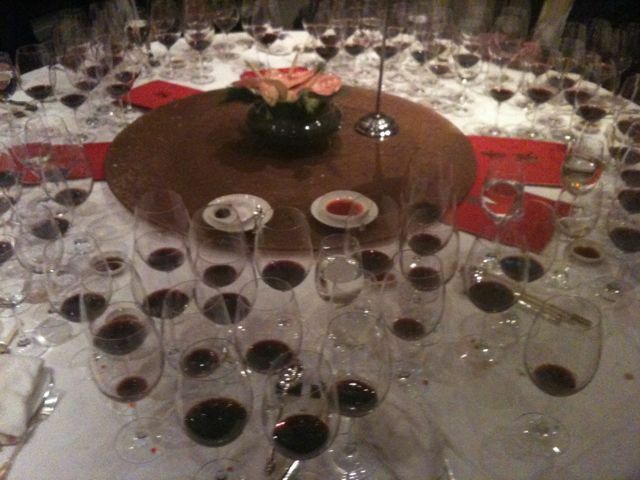 I especially enjoyed the 98 and the 2000 while their black purple in color’s 2005 vintage, I like the coffee, blackberry on the nose. 05 and 00 vintages are both full-bodied and very close to each other as in their velvety tannins and a long aftertaste of toasty oak and ripe fruit with a proportion finish. I’d think 05 is bit close for now and would be sweet to drink years later. I actually had the 2006 and it seems its a better drink than 05 for now. It was such a great night with newly met wine lovers (Fiona’s friend) being kindly arranged to have their company and sitting next to the very humorous John Kapon and Hubert indeed. Hubert invited me to visit him and his family over this coming summer. “A tea party instead of wine sounds great?” I was joking as I was quite drunk last time visiting. “sure! we don’t just do business! we’re friends and both have a life!”. Now, am dreaming where I will be in this lovely summer…. Next Hey SEVVA, where’s the math?